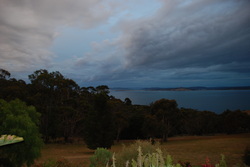 Words Tasmania is based in beautiful southern Tasmania, on the 43rd parallel, at tnhe top of the d'Entrecasteaux Channel, named for French explorer Bruni d'Entrecasteaux. Inspiration for your French to English translations is drawn from this view. Down the estuary to the south lies only Antarctica.